Here is a walkability map of Seattle, showing areas reachable via a casual stroll within 1, 2, and 3 hours. The geography of Seattle is warped to conform to these walkability rings. In 2011 Kirk Goldsberry showed me a yellowed old draft manuscript of Waldo Tobler’s (covered in his hand-written notes; it was awesome) in which he’d diagrammed a map of Seattle this way. I always wanted to try it but wasn’t sure about how. It occurred to me that I could hijack a georeferencing feature to warp, like a rubber sheet, totally unsuspecting isochrons into these rings. More than 100 control-points later, it worked! Here’s a more detailed walk-through of the process. So, here it is. Seattle, in a much more realistic (to a pedestrian) projection. 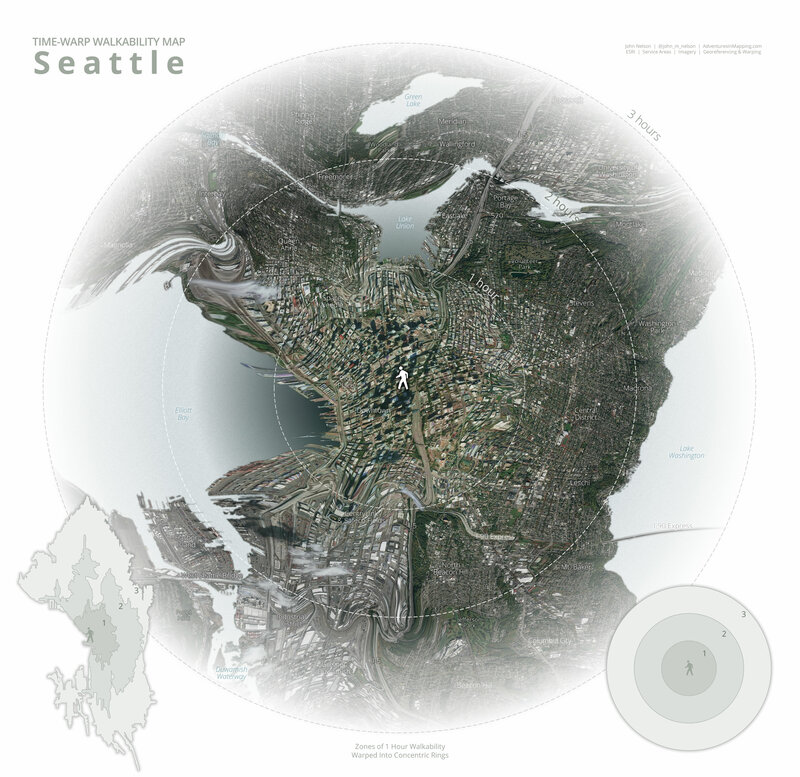 Check out this fun animation of Seattle walk times warping into concentric rings!